When people find out I know anything about knives, one thing I commonly hear is "All of mine are total junk" usually followed by something like "I'd get something different if I knew what to get". This post is to help people with questions like that. Where the topic is something they're mildly interested in, but want a simple recommendation instead of a long lecture about the reasons why. Oh, and a quick note about kitchen knives. PLEASE do not keep them in a drawer, or put them through the dishwasher. A drawer is a bad storage place for knives because 1) the knives knock against each other dulling themselves, and 2) its not really safe to reach into a drawer of unsheathed knives (particularly if they are sharp like they are supposed to be). And the dishwasher can do all sorts of things to knives. The water and heated drying can warp the handles (particularly wooden handles), get water into places it shouldn't be at cause rust, and even dull them. The proper way to store a sharp knife is to keep it in a block, or on a magnetic strip. Each of these keeps the blade away from anything hard that could dull it, and keeps everyone involved fingers and toes where they are. Buying a set actually usually just gets you a large block of knives most of which you don't actually use. Because of that, I actually just recommend buying a few knives you know you'll use. You can buy a block separately, or even build one like I did HERE. Well, here is what I recommend. There are VERY expensive kitchen knives out there, but most people they won't really appreciate them (or take care of them). Thankfully, these knives are not expensive. These knives though are good "enough" and have great value. You'll want a "main" kitchen knife. Usually this is somewhere between 7 and 10 inches long, has a tall face (blade is "tall" when viewed from the side) and a good belly (unsurprisingly the "curved" portion of the blade). You'll use this one for slicing tomatoes, potatoes and most other kitchen tasks. My wife and I have two Chefs style knives. An 8in French (traditional) chefs knife, and a 7in Santoku (Japanese chefs/cleaver hybrid). Of these two knives, I personally find myself reaching for the santoku more often. It is thinner, and the handle is more comfortable in the pinch grip that my wife and I tend to use. You might have a different preference though. Here is the first knife I bought. Bought it after lots of research for a "budget" kitchen knife led me here. The knife is made by Victorinox (the company is better known for its "Swiss Army" knives) and has a great handle texture. Its never slippery even when wet, and isn't ever going to warp, crack, etc. Here is the Santoku with the slightly different handle. This is a small knife that while not as frequently used, it is very useful when you must use it. I actually haven't purchased a specific paring knife. I have a half decent pampered chefs knife that was gifted to my wife and I for our wedding, and that sees most of the paring knife use. That said, unless we're taking the top off of a strawberry our paring knives don't see much use. Since I've had good results with the other Victorinox Fibrox knives, even though I don't have any personal experience with their paring knife I feel good recommending it. If you eat unsliced bread frequently then a real and bread knife is super useful. If you don't, then your chefs knife will work for the few times you actually need to slice bread. These are usually 10-12in long, and commonly have a serrated or waved edge. With just those three types of knives you'll be set for most of what happens in the kitchen. Keep them sharp, and I doubt you'll have any complaints about them. Here is the bread knife I have. Once again, for the record, these knives have gone up quite a bit since I purchased them. Still though, they're a decent deal. What would I buy now? I would be recommending the Victorinox knives right now if the prices had remained where they were two years ago. I purchased each of the Victorinox knives I have now for roughly ~$23. If you've been checking the links in this post, you'll notice most of them going for roughly double that now. In light of the price hikes on victorinox knives I don't think I would actually buy them right now. I know I mentioned that knife sets should generally be avoided, but there is one that I'll say is worth it. 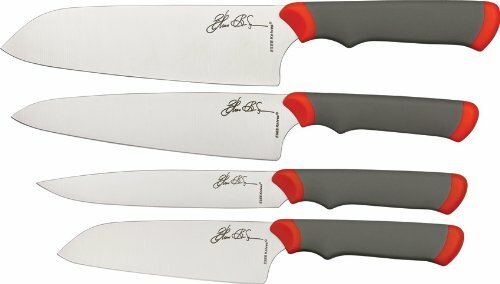 The Ethan Becker Signature series knives are totally worth the (low) price of ~$57. This set though is a far cry from the usual Wal-Mart set that contains a cheapo chef knife, 3 utilities you'll never use, and 8 really dull steak knives. In fact, when they were released they were selling for $150. So buy them while you can at that low price. This knife set was designed by Ethan Becker. Most of you will have no idea who that is, but trust me, its a good thing (Ethan Becker is Co-Author to the world famous "Joy of Cooking", and a renowned knife designer and maker of more than 25 years. He also happens to make my favorite camping knives, but that's for another post). Also, these knives are manufactured by ESEE. Again, I don't expect people to know most knife manufacturers by name. But they are known for two things. World class knives, and an unlimited lifetime warranty that TRANSFERS between owners. So no matter what, if there is a problem you get a new knife free of charge. I recommended that my mom get this set, and now I can actually recommend them on the quality of the knife because I have actually handled them. I have more knifes than most folks, and I can say that this knife set by FAR is the sharpest I've used (out of the box). The only "reservations" I have about these knives are that the sizes are a bit off from what most would say is "standard" (largest is 7 inches). Also, the handles have some orange on them. That may be a deal breaker to some if it doesn't fit into the motif of your kitchen. So if you've been hankering to try some better kitchen knives, I'd spend the ~$60 on the set of 4 of Ethans ESEE made knives. And maybe throw in a paring knife and a bread knife if you feel the need. As you know this is the first of my posts like this, so let me know what you think of it in the comments :). I am a self proclaimed man of many interests. One of my overall goals in life is to become a "renaissance man". Many of the things that I will post to this blog are things that related to that goal. My current interests include (and are not limited to) camping, offroading, gaming (particularly starcraft 2), weight lifting, audio/video/home theater, knives, overclocking, computer building, and computer infrastructure. This blog is meant to be a place where I can post what I've learned, teach something, and like to do in my spare time. *disclaimer. I am not the be-all, end-all of knowledge. I am merely a guy who likes to learn about things, and then help teach others about them.